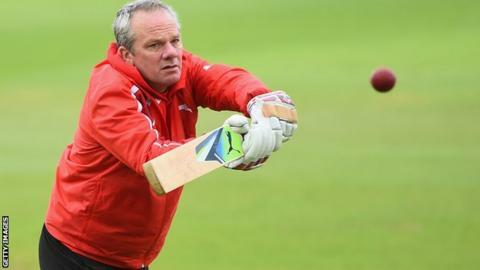 Nottinghamshire director of cricket Mick Newell says the chance of a Lord's final is a motivation for his side. Notts will host Durham in the quarter-final of the One-Day Cup on Tuesday after finishing top of Group B.
Newell told BBC Radio Nottingham: "We'd like to get back to Lord's. It was a great thrill and experience two years ago, so let's try to do it again. "It's a tournament which has excited us since we started and let's try to make the most of it." Nottinghamshire's final game in the group stages against Hampshire was rained off on Wednesday at Trent Bridge, but both sides qualified for the last eight. Notts won the YB40 in the competition's final year of existence in 2013 when they beat Glamorgan by 87 runs. But they missed out on a visit to Lord's again last year when they were beaten by Durham in the semi-finals in the first year of the 50-over One-Day Cup, after beating local rivals Derbyshire in the last eight. "Last season was good when we beat Derbyshire at Trent Bridge but we fell at the hurdle of Durham in the semis," continued Newell. "We've played some really good cricket in the competition this year again, winning five, had two rained off and the one loss."